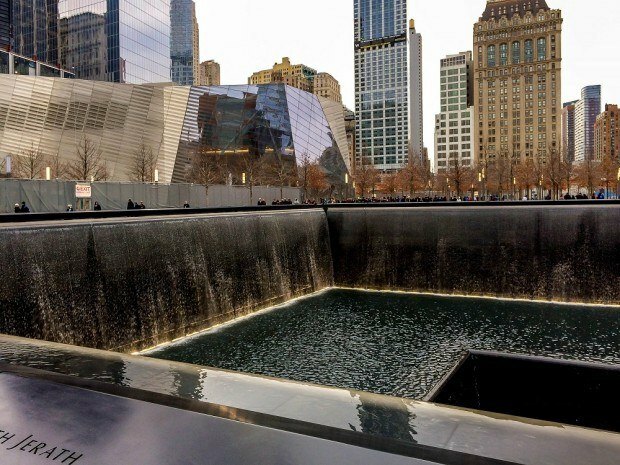 Standing in the middle of the plaza that used to hold two tremendous towers, the sound you hear above all others is rushing water. It was meant to be that way. The millions of gallons of water that cascade down the waterfalls were intended to drown out the noise of New York. No small task. Unusual. But it seems completely appropriate in the middle of what is essentially the resting place for the thousands of people who lost their lives on September 11, 2001. Although the 9/11 Memorial (aka National September 11 Memorial) has been open for two and a half years, we just had the chance to visit on a recent trip to New York. If we’re being honest, we probably put it off longer than we could have. 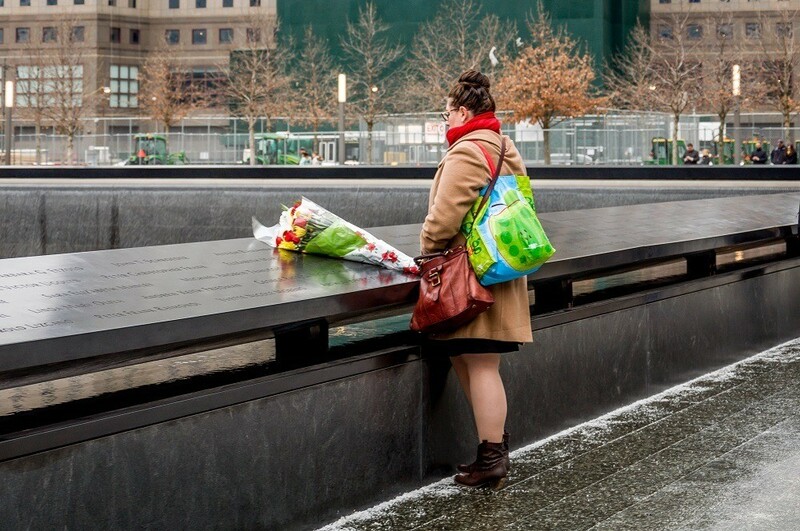 We visited Ground Zero just a few months after the attack but haven’t been there since. There’s something about that site and that day that pulls us in opposite directions — the absolute need to remember and pay our respects balanced against the desire not to let our thoughts overwhelm us. 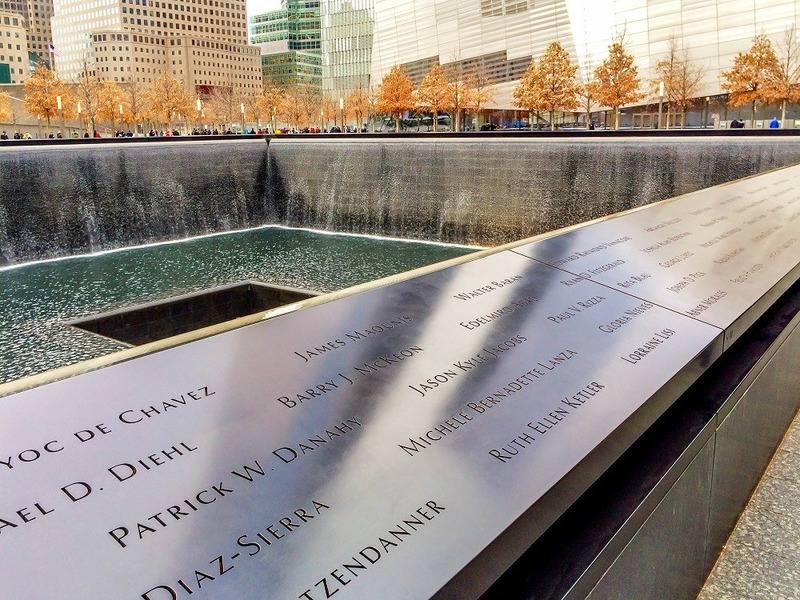 Most people over the age of 20 will remember with striking clarity where they were on September 11, 2001. We lived in Manhattan then. It was a beautiful, crisp late summer/early fall day in the city. The sky was a cloudless brilliant blue. It was primary day for the New York mayoral race. I was in the second week of my junior year of college, and Lance was working at a public relations agency in the Flatiron District. Those were the mundane details of our life. Until everything changed. 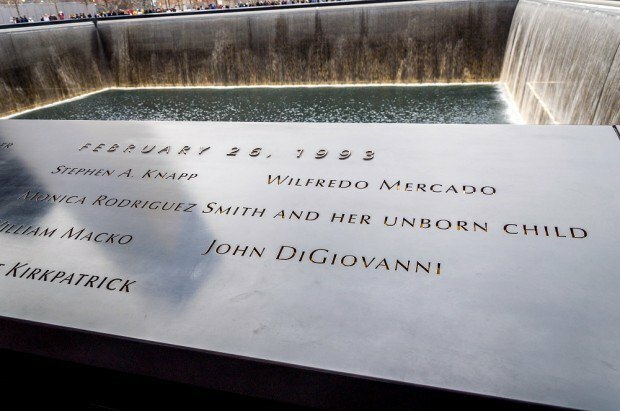 Like everyone who lived anywhere near New York (or anywhere at all), we have a story about what happened that day. It involves being glued to Peter Jennings on ABC 7, trying to get word to our friends and families over the jammed phone lines (or through AOL Instant Messenger) that we were OK, and generally trying to wrap our minds around what had happened downtown. There were things like campus-wide blood drives (that turned out to be unnecessary) and the nun we watched praying the Rosary in front of a wall plastered with the photos of the missing. Without subway service, Lance walked four miles home that day. Without a clear read about what was happening, my campus was locked down mid-morning before all the planes were accounted for. By the early evening, all we could think to do was take a break from watching TV by walking around the Upper West Side reservoir. Across the expanse of the water, we could see the haze of downtown. The smell and pulverized debris of the day hung dreadfully in the air. It was all illuminated a strange burnt orange as sunset approached. We didn’t know what to do, so we just keep walking. Until it was time to go home and watch more TV in hopes that someone had an answer. For several days, life in New York was kind of on hold. Classes resumed, but professors didn’t expect much and let us talk about whatever was on our minds. Lance’s co-workers – many of whom were from New York- slowly got updates on old friends and extended family. It seemed that almost everyone knew someone who had lost someone. Soon, the tributes began. The American flags flew everywhere. There was a run on the famous I Heart New York t-shirts. The weekend came, and we tried to reclaim some kind of normalcy in the midst of the chaos. After dinner at our favorite restaurant that Friday night, we took a cab in the direction of home. Our ride overlapped the time for the city’s appointed candlelight vigil. As the cab zoomed north on Broadway, the whole city seemed to stop. Store clerks, servers, and general people on the street all stopped for a moment of silence. The store lights went off and the candles were lit as each person stopped to pay tribute to the first responders, the people who were going about their daily work at the World Trade Center, and those who lost someone. It was before the days of the ubiquitous cellphone camera, so even though we don’t have a personal photo, for us, it remains one of the most indelible images of that whole terrible time. Within a few months, the city began the Tribute in Light — two enormous blue beams lighting up the Manhattan sky in the place where the towers were. They continued for over a decade until the land was turned over for the Memorial (and the Museum set to open in May 2014). It has been almost 13 years. Now the intentions behind that candlelight vigil and the beams of light have become concrete in the 9/11 Memorial. The walls surrounding the 1-acre-square pools hold the names of everyone who died that day in New York, Washington, D.C., and Pennsylvania, as well as in the 1993 bombing. It is a somber space on hallowed ground where the sound of the water drowns out everything that interferes with reflection. 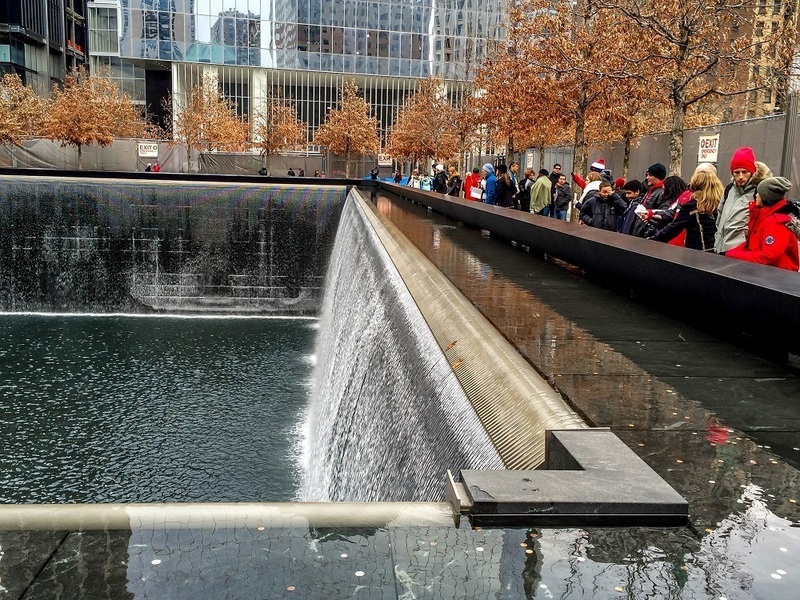 What do you think about Memories of That Day — A Visit to the September 11 Memorial? What a thoughtful, well-written piece. It’s a subject that can still move me and I confess a tear in my eye as I read this. I haven’t seen the memorial complete and your description of being torn about visiting is probably apt for many people. Thanks, Jo. The completed memorial really is beautiful. Will be curious to see how the museum turns out too. Thank you for the virtual tour. A native New Yorker, I drove by the towers a month beforehand and haven’t been back yet (though I did fly past a few months after). It looks beautiful and a good thing to see when I’m finally back in NY. Thanks again. Definitely recommend a stop there, and the museum will be open soon too. I remember 9/11 like it was yesterday. 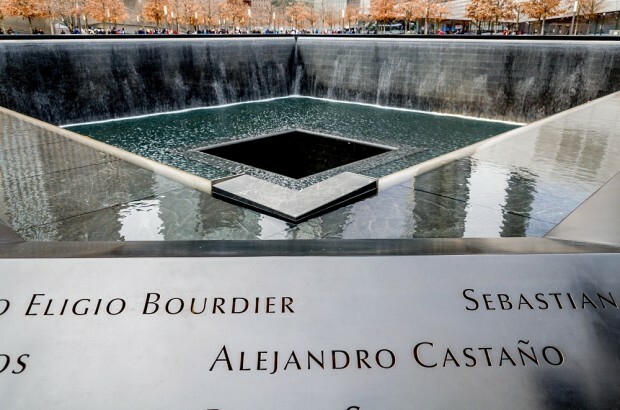 I really want to visit the memorial, but have yet to make it back up to NYC. 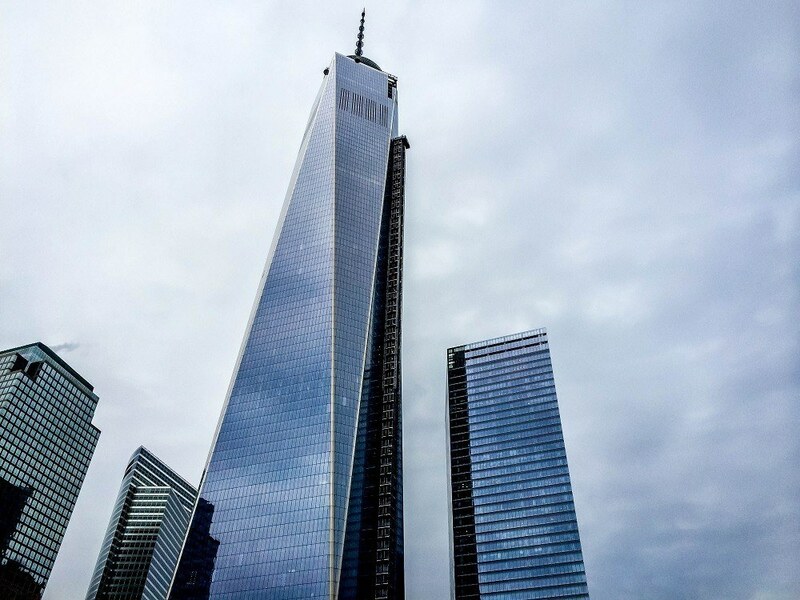 The last time I was in New York my sister wanted to go and while I wasn’t enthusiastic I was pleasantly surprised to see how it was handled. I was worried it would be over the top but instead it was very respectful and tranquil. They did a really nice job. We visited the memorial on a grey, rainy day. It was definitely a quiet and somber hour, walking slowly around the pool. 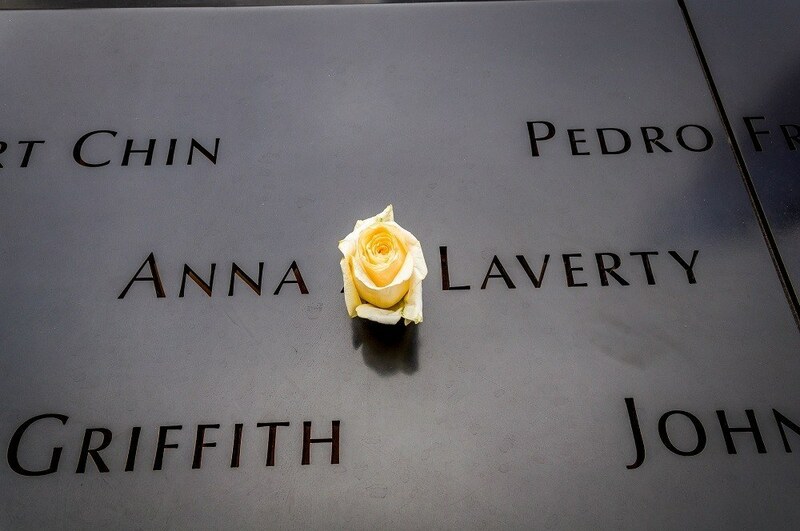 It’s definitely a touching and respectful memorial. I have visited the memorial a few times and very much look forward to the museum opening next month. It is a difficult place to be but beautiful and cathartic all the same. Thanks for sharing your story. This is beautifully written. With so many accounts out there about 9/11, it’s lovely to read something so personal and honest. Thanks, Christine. That’s really kind. Great post! We too went to New York a few years after 9/11 before they figured out what they would do with the space. At the time it was a big hole with construction going on all around. This is the first post I’ve seen on how it looks like now and I’m impressed by what they’ve done. Spanky is originally from NY, we’ll have to try to make it back.